All of my classes have independent study options - just ask! spindle spinning basics and way beyond the basics. Maine Fiber Frolic, Fiber College and at museums, schools and guilds. I teach kids and adults in all kinds of settings. and get ready to roc again! 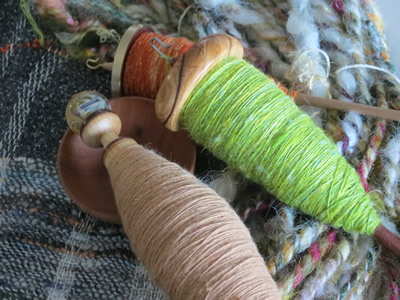 Bring your own spindle or use spindles and fibers provided for in class use. Learn the technique and get hands on practice for making a corespun yarn. Corespun yarn has a distinctive look and can be spun in sleek or wilder versions. 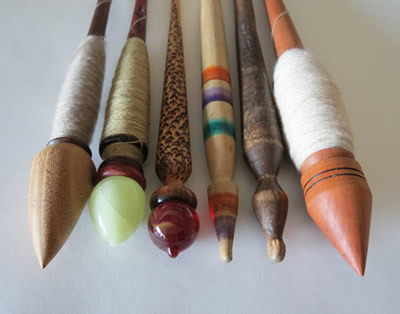 Bring a spindle and any fiber you'd like to try or use instructor's. 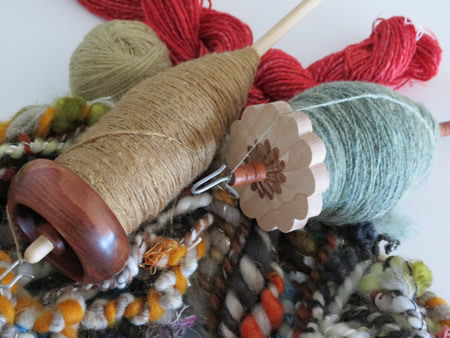 A whirlwind tour through the basics of making any kind of yarn on spindles. Try them or give them another try. For portability, cost and versatility, they can’t be beat as a spinning tool. crochet, knit or weave and want to have some fun. Try a variety of these spindles, dahlink...from traditional to contemporary adaptations. Relaxing, can be easy on the body and great for spinning a variety of fibers and preparations, especially for short fibers and fine yarns. We'll spin in supported mode - experiment and find out whether they're for you! For new and experienced spinners and curious yarn users - those who crochet, knit or weave. Spindles and fiber provided for in class use. cost is minimal and the process is fun! or bottom whorl spindle, weighing about 1 oz - 1.5 oz. Open to beginners and those who want to try spindles again. For portability, cost and versatility, they can't be beat as a spinning tool. Spindle and fiber provided for in class use. 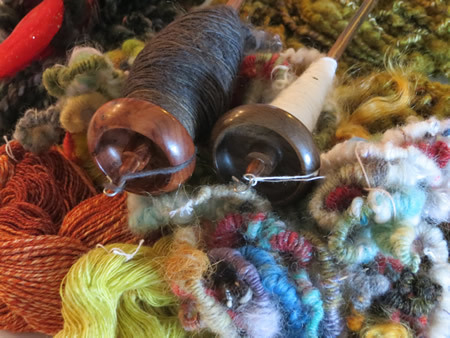 Using spindles, learn to spin your own yarn from wool or a wool alternative. for knitting, crocheting, weaving and more. you'll leave with lots of inspiration to continue practicing and learning on your own. Taught regularly at my studio (Plymouth, MA) in groups as well as privately. Participants in an Out There Spinning Workshop! 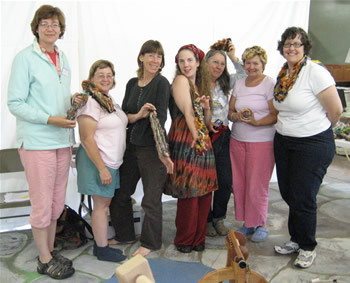 Classes held in my studio in Plymouth, MA. or your guild location. Please email me with any questions. Class info will be sent to registrants. use for weaving, lace work or embroidery floss, among other things. variety of silk for you to play with. Open to beginning and advanced spinners. incorporate into a larger quilt at home or a small child-size quilt. In our time together, we'll touch on the sacred beginnings of embroidery. surface, to make it speak. Our experiments may become books, quilts, clothes, poems. on, that'd be great. Otherwise, Linda will bring surface/fabric. gives us as we work a bit with our usual materials or try something new. it related to my work was time well spent. how to transform it into projects in unique ways. to use in class. If you'd like to bring a camera, that's fine too. 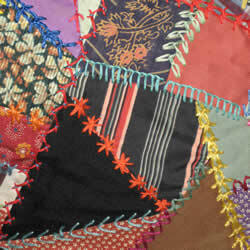 weave, quilt, embroider, create art or just enjoy life! Can be taught in a 3 -4 hour class as well as weekend/week long format. Email me to bring it to your location! 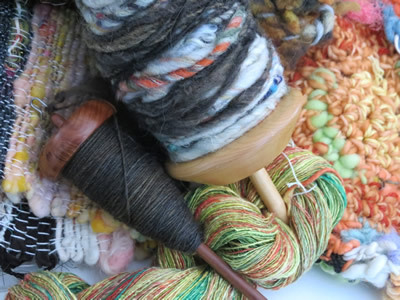 then explore different fibers and how they can be used to create offbeat yarns. with an artist who has created yarns of every imaginable type. and in my studio in Plymouth, MA. in Boston, MA (USA), and can travel anywhere. Don't Be a Wimp - Spin Cotton! All class/workshop descriptions are © Linda Scharf.